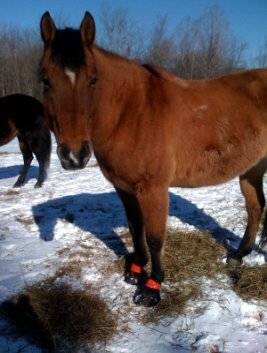 One of our customers, Linda Laveway, bought some new protective horse boots for her horse Clint. 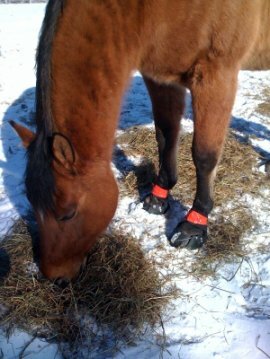 Clint decided he loved his new Easyboot Epics so much that he tried to eat them! Linda only left him turned out for a half an hour, but the damage was already done. Clint had eaten the velcro right off his Gaiters! Not to be discouraged, Linda has duct tape the gaiters in hopes to make them stay on! 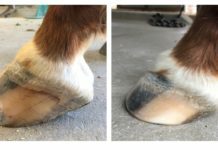 If you have a horse that you know loves to chew or get into things make sure you don’t leave them unattended with their boots. 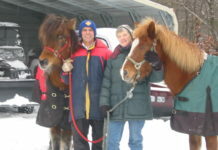 Something you can try is putting Yuck Spray or cayenne pepper to deter them from chewing on their boots! 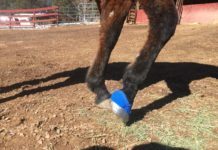 Next articleWhat a year for the Easyboot Glove and Barefoot Horses!